Posted on August 23, 2016 by Elizabeth E.
A few months ago, Vicki contacted me and asked me if I wanted to do a Friendship Swap. I almost said no, as I had sworn off of swaps, but I so like her work that how could I not say yes? So I agreed to do one more swap. We chose the theme of summer, set a date and a size, and we went to work. 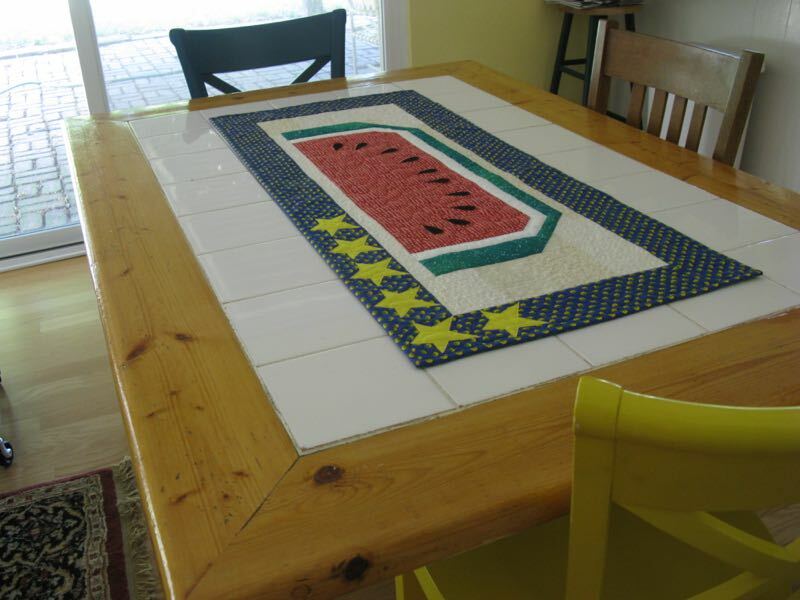 I found this cute free watermelon table runner *here* (I think you have to register with them to get it, but there is lots of great stuff on this site), and set to making it. I had to stop working on it when I injured my shoulder, but when Vicki told me she was all finished and could she send hers early? I just put my brain and body into gear and finished it up. She has received it and said she really liked it, which is so nice of her. She sent me hers, which I love love love, and a small mini (below). This is typical of Vicki’s kindness, as well as her creativity. Who else could have made a fabric cut-out so cute, with all those darling borders? She said it’s in honor of me, going to a quilting retreat. 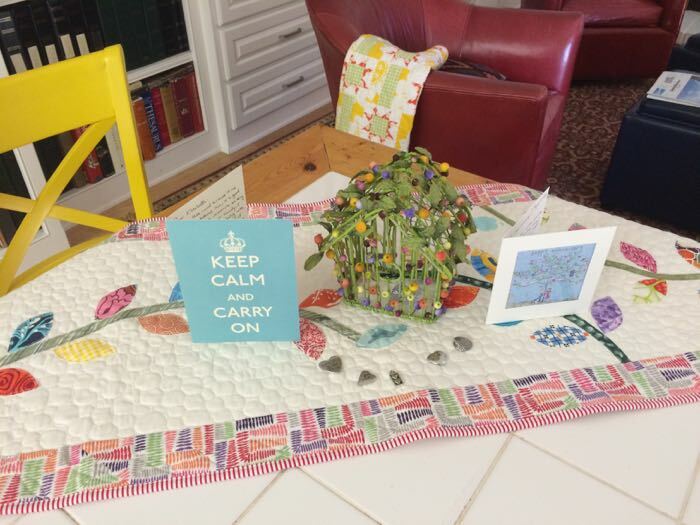 We keep her table runner on our kitchen table, and after we’d opened our anniversary cards, I set them out next to the little birdhouse I’d placed in Vicki’s leafy tree-tops. What a terrific and fun swap to end on! (And yes, I’m really done now with swaps, but I know Vicki is still going strong!) 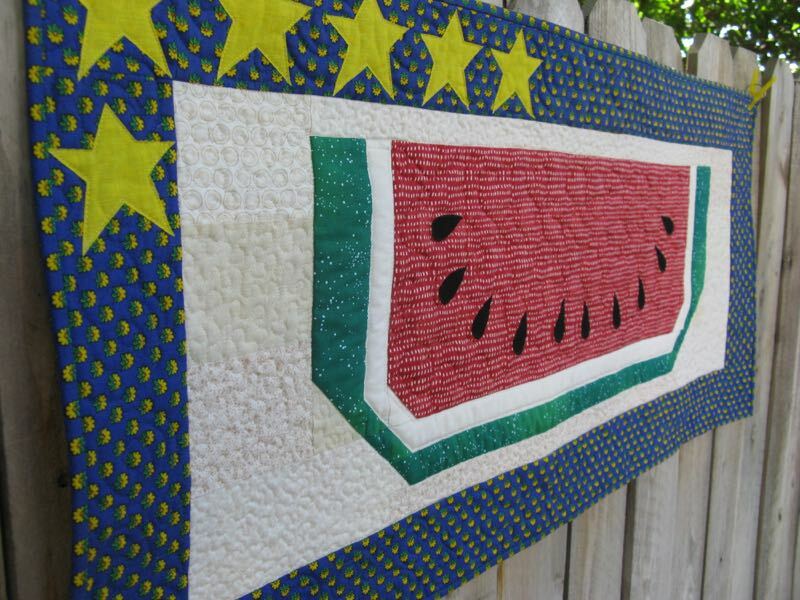 This is Quilt #168 on my 200 Quilts list (in above tab). 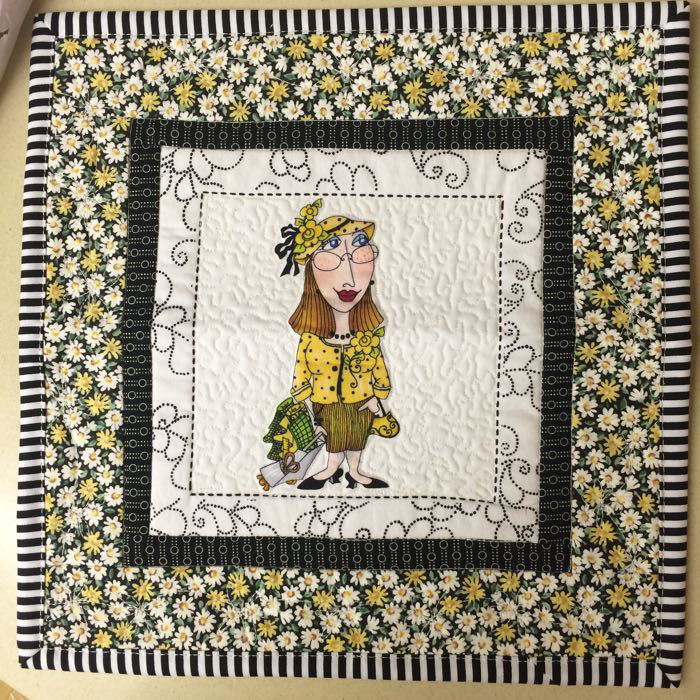 If you haven’t started making your list of your quilts ane projects, I’d encourage you to start now It’s very fun to keep track of your quilts and creative endeavors. What a win-win your swap was! I love the watermelon and the vine runner- both testimony to your skill and talent! I agree, having a permanent record of the quilts we’ve made is so important- if they don’t admire them in a museum (ha, ha!!) they may as well look at them on a computer! 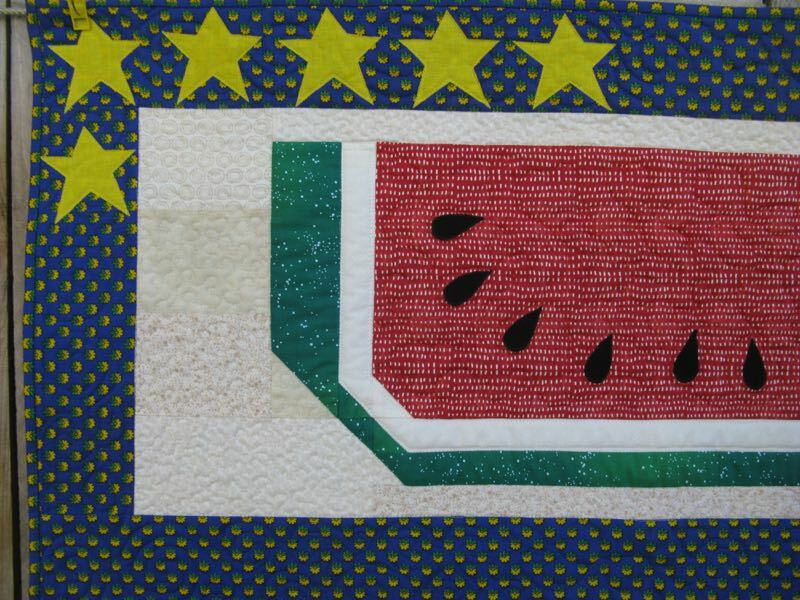 Enjoyed seeing your watermelon mini and your swap partner’s quilt is so pretty. 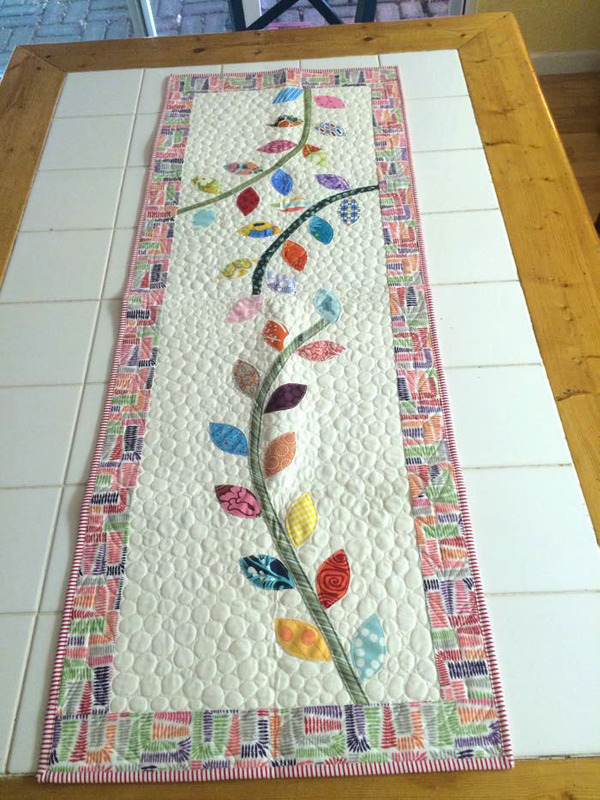 I always love seeing quilts with leaves in them as that is one of my favorites. There is a quilt of Kim McLean’s that is all leaves that I hope to make one day although not as large as she makes them. Thank you also for sending me your trip photos – glad you had a great time. I love both of these runners, and that little mini is wonderful. Two talented ladies! I agree that keeping a record of quilting projects is super important and satisfying, too. This looks like a successful and fun swap and I am really starting to limit myself, too. There is only so much wall space, etc.! I have signed up for the All People Quilt (American Patchwork & Quilting) site but forget about all the great ideas there!!!! Yours is so much nicer than the one shown (your fabrics seem to strike me more positively!) and your topper from Vicki is awesome!!! so “YOU”!!!! The added cutie is so sweet! Quilty Friends Are Best!!!!! Hugs…….. It was my pleasure to do this swap with you! Thank you again for my beautiful watermelon runner, we love it! I was excited to see your Chuck Nohara blocks. 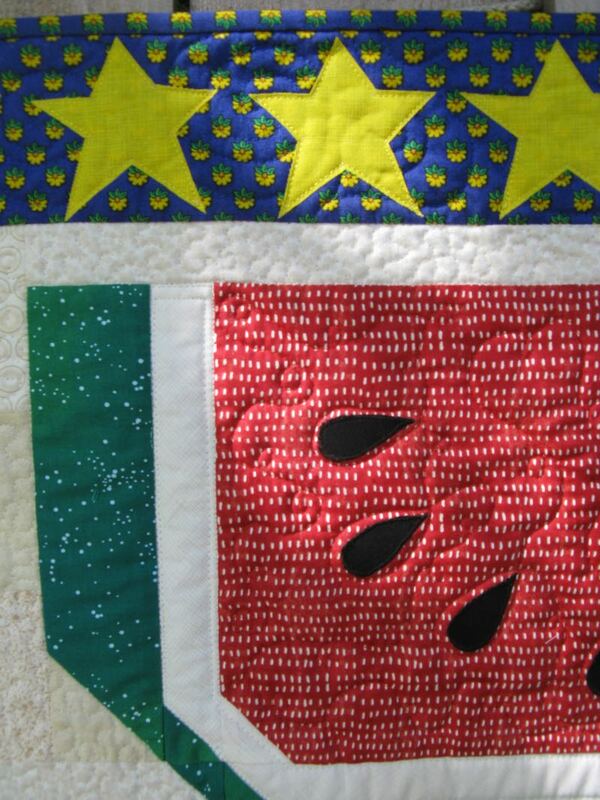 I am making a quilt using her blocks which you can see on my blog https://pamspaintbox.blogspot.com/. I have not used any of the blocks you have used so far but seeing them done up gives me ideas of how they would look in my colors. i love how your have followed Chucks idea of using wild and crazy, brilliant and unique fabric for your blocks. i mired myself in pastels as the quilt started as a Stonefields which (to quote Bob Dylan) soon led to the harder stuff. Stonefields is such a pretty quilt but i found I could not continue with her blocks as they were very simple and repetitive.